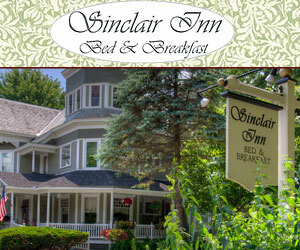 Enjoy gracious Vermont lodging at the Sinclair Inn Bed and Breakfast. Just miles from the bustle of downtown Burlington the Sinclair Inn offers you exceptional accommodations in a fully restored 1890’s “Painted Lady”. Sinclair Inn Bed and Breakfast is within a short driving distance to the Shelburne Museum, Shelburne Farms, the University of Vermont, Saint Michaels College, Boyden Valley Winery, and the New England Culinary Institute, as well as the Vermont Teddy Bear and Ben & Jerry’s factories. Whether you are coming to visit friends or relatives, have a romantic weekend, touring the Champlain Valley or just enjoying the beautiful garden and back lawn views of the surrounding wooded hills and sunset, you will enjoy your stay at the Sinclair Inn Bed and Breakfast. A highly recommended historic Vermont Inn. Ask us about Burlington Essex Champlain Valley VT Lodging. If you would like to add your Essex Burlington Vermont Country Inn, Lodge or Bed Breakfast Inn to this web site, please contact us.